This movie is super-duper cute. "Cute" gets a bad rap, I think; to me, it means endearing, appealing, and engaging. Chashme Buddoor is all those things without being gooey, and it's chilled out (like its lazy-day-loving trio of friends) without being dull. It's nicely paced and funny with likable, well-acted characters who indulge their imaginations and hopes in non-ridiculous ways. It has a good plot about friends, which I always like. Its filminess is winking and welcoming. "C'mon," it says, "you know you've always wanted to make up a rhyming love song with your crush while lying in the sunshine in the park." (That's not just me, right?) It feels so real. There's a nice writeup over at Alternate Movies, who rightly points out that a significant part of this movie's appeal is that the events and people are relatable - life is full of funny moments that don't need to be exaggerated or amplified to make us laugh. 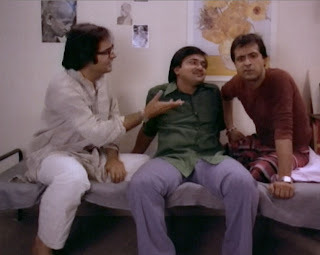 Chashme Buddoor is so simply good - uncomplicated and fun - that just maybe the above comments will suffice. Instead, pictures! So cute! So charming! Cho chweet! 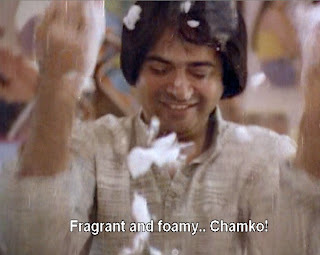 Farooq Shaikh, Rakesh Bedi, and Ravi Baswani are all great. From the fab song of the three friends, "Pyaar Lagwat." Imagining life as a film. And Deepti Naval is of course great too. Falling in fragrant, foamy lurve over a box of soap. If anyone can point me to another great Sai Paranjape film, say the word. Many thanks to Filmi Geek for loaning me this one! If you liked Chashme Buddoor, you'd also like Katha. Without a doubt, you need to watch 'Katha' starring Farooque Sheikh, Deepti Naval and Naseeruddin Shah (dir. by Paranjape). A brilliant little gem of a film, I'm sure you'll love it as much as I do. Hey Beth, glad you liked "Chasme Buddoor". I love that movie. I was also gonna suggest "Katha". Here's the link to the review http://jaiarjun.blogspot.com/2007/01/sai-paranjpes-katha-tortoise-therapy.html by another fav blogger. Glad to hear you discovered Chashme Buddoor! It's one of my favourite little movies. *Sparsh* is another lovely Sai Paranjpe film, not funny like *Chashme buddoor* but every bit as sweet. Katha is great of course, but if you havent, you have GOT to watch Sparsh- it is super wow amazing- bearable pathos, but I cried buckets. Sadly Sai Paranjape doesn't get enough funding to produce her films. She is a brilliant director with a special space in her heart for children's films. Get a copy of her recent film "Pak Pak Pakaak" which is about a young school-going kid and a ghost in the village. It also stars the brilliant Nana Patekar. This movie is in "Marathi" so you would need subtitles anyway. Hey, where'd my comment go from two days ago?! Bloggerhate rising. 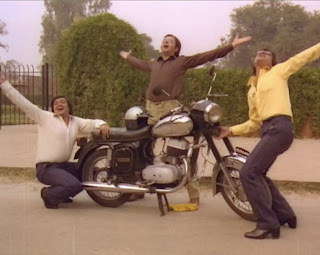 Just wanted to mention that there is a scene in which Farooq tries to pick up Deepti at a bus stop on his black motorcycle and the song "Kalighodi dwaar khadi" is playing. And since this was such a cool reference - calling a ride a black horse (or mare if you'll have it), that I've always bought black cars and called them all Kalighodi. My kids like that name too. Watch "Chupke Chupke" by Hrishikesh Mukherjee. Dharmendra and Amitabh Bacchan. Sharmila Tagore and Jaya Bhaduri. The best of the lot. Banno - I love Chupke Chupke :) It's ever so cute and funny - and it made me fall head over teakettle for Sharmila! I was all prepared to suggest KATHA to you, but then I saw a lot of people have already recommended the same :). And yes, you just HAVE to watch 'Sparsh'! btw..I could go through your list and check but based on an assumption that you liked chupke chupke..
Debashri - I am so sorry for the delay in responding toy our comment! Somehow it slipped through my email cracks. Thank you for the recommendations! I don't know of Vijaya Mehta - but interestingly I've just rented Kalyug. @beth : hope you like those too..I typically always like almost all hrishikesh mukherjee movies..
doesn't sound like they showed any new hindi movies @ boardmans recently..
yeah i really love katha and chasme badoor too. i still remember one scene from "katha" where naseer waits for the bus ,but when he heard a girl need blood of AB POSITIVE he hires a taxi and runs to the hospital because his blood group is the same and it's a rare one. i can never forget that scene. ligne - Sorry this reply is so later! They haven't played any Hindi films at Boardman since last March, but someone is showing them occasionally in Bloomington-Normal and Leroy - so at least they are within an hour drive! Do visit when you have time and tell me how's it. Take care. Sharmi - Thanks for commenting and sharing your blog! I look forward to reading it :) Thanks also for the reminder about Katha - I need to go write that down and not forget about it this time! SAAZ starring shabana azmi and zakir hussain...lovely muv by sai!! !